Significant obstacles often block the path of promising new routes. The key is to stay focused, so that you can ultimately arrive at the planned destination. After several formidable years as a result of one of the worst recessions in history, the positive results of the decisive management decisions made to deal with financial challenges were fully realized in 2011. This allowed major initiatives to move forward and for RTA to move more people to their destinations, generating momentum for Northeast Ohio. The local economy achieved positive growth last year. From manufacturers to medical and health care providers, Cleveland-area employers were financially stronger and hiring once again. This was reflected in RTA's ridership numbers. Overall ridership was up 3.6 percent. Even more impressive was the dramatic jump in rail ridership, which increased by 8.7 percent, and HealthLine ridership, which grew by 7.8 percent. The HealthLine also reached a major milestone, when the 10-millionth rider boarded the route in April. To continue this growth, RTA worked in partnership with employers to convert work-trip commuters from drivers to riders through its Ready to Ride Program. Employees were educated on the many bus and rail routes available, were provided incentives, and then were connected to a personal transit assistant. Sherwin-Williams, Medical Mutual and Forest City worked with RTA to participate in this innovative program, which realized a 30 percent conversion rate. RTA reached out to younger commuters as well. Instead of going for the hard sell on changing the driving habits of college students and young professionals, the transit authority used Facebook to build a relationship. It offered weekly giveaways to local concerts, restaurants, and sporting events, and talked about the ways to get there on trains and buses. With this approach, RTA was able to build its Facebook fan base past 12,000 -- the most fans for a transit authority next to Bay Area Rapid Transit in San Francisco. Outside of cyberspace, RTA was busy creating new spaces for riders. It opened the $9.6 million Puritas/W. 150th Station, one of the transit authority's busiest rail stations. On the other side of town, it completed the East 55th Street Station, which serves all three rapid transit lines. Ground was broken in the summer for a new Buckeye-Woodhill Station, and plans were unveiled for a new Red Line Rapid Station at University Circle, with construction to begin in 2012. In addition, RTA received a $12.5 million FTA grant for a new station at Mayfield Road. Located several blocks west of the current E. 120th Street Station, the new stop will serve as a gateway to the Little Italy neighborhood when it's complete. While ridership numbers grew, so too did the savings posted by RTA through its TransitStat management initiative. The initiative is built upon data gathering, review and analysis to refine processes and accelerate change. This process helps the transit authority reduce costs, increase efficiency and improve performance throughout the organization. In 2011, TransitStat achieved nearly a million dollar savings in electrical energy consumption and more than $3.6 million in diesel fuel savings from commodity hedging. This is on top of $24 million in savings achieved by the initiative over the past three years. 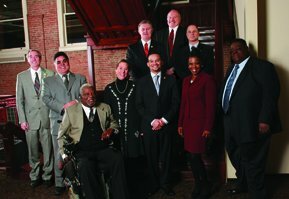 TransitStat and tight fiscal management allowed RTA to finish 2011 financially stable. So much so in fact, that Fitch Ratings gave RTA bonds an A+ rating. The transit authority's financial team is proud of this result. They are also pleased that the belt tightening will allow the authority to add 4.3 percent in transit services and hire 50 new positions in 2012, all without raising fares. While RTA's current financial position is strong, there is worry about tomorrow. Transit funding from the State of Ohio continues to be among the lowest in the country. Federally, there was debate in Washington, D.C. on cutting transit funding by as much as 30 percent. This prompted RTA to join transit systems across the country in the Don't "X" Out Public Transportation demonstration to raise public awareness. Another high point for the transit authority last year was national recognition on several levels, from workforce diversity to efforts on environmental sustainability. For the second consecutive year, the American Public Transportation Association awarded RTA GOLD, the highest safety honor, as a result of the positive and proactive safety and security programs implemented to ensure the safety of employees, passengers and the public. In 2011, cranes appeared Downtown for the first time in many years. The $522 million Flats East Bank project rose from the ground, while the $465 million Medical Mart & Convention Center project went deeper below the streets. At the same time, the historic Higbee Building was being transformed from a department store to Ohio's first full-service casino. And during all this construction, RTA met with the project planners of these initiatives to offer service that would meet their future transportation needs. RTA's rail lines and HealthLine will be vital to these projects in order to accommodate the millions of visitors and employees expected in the downtown area in future years. And as a supplement to these routes, RTA worked with business and community leaders to develop and fund new Trolley service. The E-Line and B-Line will be joined by the C-Line and L-Line in 2012. These new routes will provide evening and weekend service to the casino, convention center, hotels and lakefront attractions. Thanks to this creative public-private partnership, all the Downtown Trolleys will be free to ride with a smile. Besides planning routes and schedules last year, RTA worked on programs to support tourism. The transit authority participated in a regional Tourist Summit to discover ways to enhance the visitor's experience. From these meetings came the creation of the Cleveland Pass, special 1-Day, 2-Day and 4-Day farecards for visitors that will debut in 2012. The transit authority is also developing a tourism brochure, highlighting the many attractions and the different ways to get to them on public transportation. By all measurements, 2011 was a good year both for the region and RTA. The future also looks bright, with the final pieces in place to create a new economy in Northeast Ohio. It's the kind of momentum you can see and feel, making the region and RTA even better. Such a great year could not have been possible without our great and dedicated employees, our Citizens Advisory Board, our elected officials and business partners, and certainly not without our customers. 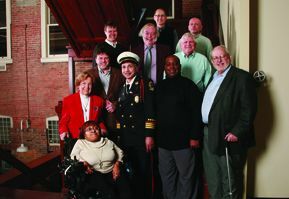 We want to thank each and every one of them for their support in making 2011 a year we can be proud to build upon. High gas prices and an abundance of construction plagued all commuters in 2011, and RTA was there to relieve the pain. With opportunistic advertising highlighting struggles facing drivers, programs such as Ready to Ride in place to incent trial, and a plethora of riding options to service all, RTA realized ridership gains across the board in 2011. All five service options experienced an increase in ridership. The HealthLine (7.8%) and Rail (8.7%) contributed the most to the overall system ridership growth of 3.6%. A highlight from all the success was the celebration of the 10-millionth HealthLine Rider in April. Kionte Watkins, the lucky rider, won a free pass for one year on RTA! Since opening in October 2008, ridership has continued to grow on the HealthLine. Currently, in comparison to the bus line #6, which it replaced, ridership is up 58%! 2012 also promises to be a successful year for RTA. As Cleveland continues to grow and new businesses open, RTA realizes the great potential for further ridership gain. The Horseshoe Casino Cleveland, scheduled to open in May 2012, is expected to generate five million visits annually, create more than 1,600 jobs for the local community, and generate $100 million annually in gaming revenue. Further on the horizon is the highly anticipated opening of the Cleveland Medical Mart and Convention Center (Cleveland MMCC) in 2013. This location was chosen for the world's only facility targeted specifically to the medical and health care industries, because of Cleveland's rich hospital systems and the HealthLine transit corridor that conveniently connects Cleveland MMCC with the local medical community. As Cleveland grows, RTA will be the critical link in assuring all the major destinations are accessible. RTA's momentum will be the driving force behind the success our city will experience. A great transit system relies on a strong infrastructure to sustain and grow. RTA proved again in 2011 that it is committed to building a world-class infrastructure to support an ever-growing system. Two new stations opened, new projects broke ground, and funding goals were met. The $9.6 million, Puritas Rapid Station opened its doors on May 17th. The new station features residential and commercial entrances, a 6,500 square foot main building, a 130-foot bridge, and nearly 600 parking spaces. The E. 55th Street Rapid Station was dedicated in October, after a little more than a year of construction. The $9.4 million investment is now fully ADA-accessible, allowing all to connect to the Red, Blue, and Green rapid lines. The new station will be a landmark the community can be proud of. The stone facade represents the many churches in the vicinity, public art lines the facility, and the new 800-foot platform is a piece of engineering art. As projects were completed, new projects got underway. The $3.3 million Buckeye-Woodhill project broke ground in June, and will require 15 months of construction before opening later in 2012. Funding needs were met for the new University Circle Station, and a $12.5 million grant was awarded to RTA via the FTA -- designated for the Mayfield Road Rapid Station project, currently the E. 120th Rapid Station. The new station will move several blocks and be reconstructed on the corner of E. 119th Street and Mayfield Road, where it will serve as the gateway to the Little Italy neighborhood and be a cornerstone to the transit-oriented development in University Circle. As RTA expands in University Circle, timing couldn't be better. University Circle is experiencing revitalization, with dozens of projects worth billions of dollars in progress. Including the $150 million Museum of Contemporary Art Cleveland, the city's leading contemporary art showcase. The museum is expecting to attract 65,000 visitors a year, while adding to the architectural brilliance of the area. RTA is committed to the growth of Cleveland and is excited to be a vital link to the momentum the city is experiencing. RTA encourages commuters to travel responsibly, because RTA itself ensures their commitment to sustainable practices. Every year, RTA implements policies and procedures to operate more efficiently, and 2011 was no different. Crain's Cleveland Business honored RTA with an Emerald Award for its sustainability achievements. Among their achievements was an employee recycling and compost program, and an energy conservation project leading to the retrofitting of more than 22,000 light bulbs, fixtures and sensors, and structural improvements that will save RTA $500,000 annually. New sustainability efforts started in 2010 also continued to prove effective in 2011. The Energy Price Risk Management Program helped RTA cut down on its fuel consumption, using 308,000 gallons less than budgeted in 2011. In addition, the program kept diesel expenses down, as prices skyrocketed in the open market. The actual price of fuel was $13.676 million. RTA only paid $9.919 million as the result of commodity hedging, realizing gains of $3.691 million. As a part of the Energy program, RTA also saw a reduction in electricity rates of about two cents/KWH for 2010 and the first half of 2011, while able to secure a three-year rate with slightly more favorable results. The first year of new rates saw great success, as electricity and propulsion power came in $863,000 under budget. Other local businesses are taking notice and putting the same sustainable practices to action. Jonathon Sawyer, owner/chef of Greenhouse Tavern and Noodlecat, practices sustainability from his sourcing of only local vendors from his menu to the recycled goods used in his decor. The Green Restaurant Association saluted Greenhouse Tavern as the first certified green restaurant in Ohio. Sawyer also encourages his employees to be as environmentally friendly as possible by using public transit. As Cleveland progresses, businesses, population, and traffic will continue to grow. RTA embraces its role to provide the community with a sustainably responsible way to commute. 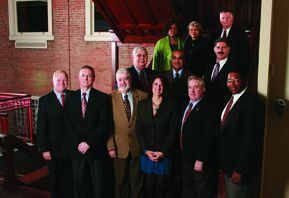 RTA created a new ridership program in 2011. The program entitled Ready to Ride, targeted Downtown and University Circle employers. As the largest employment centers in the region, these two areas offer commuters a multitude of transit options. This program takes advantage of the many bus and rail routes to encourage employees to try transit. Ultimately, the goal is to switch them from driving to riding, saving them money and promoting sustainability. This is how Ready to Ride works. RTA holds a kick-off meeting where employees are given two free Work Week Passes, a trip planner, and a personal transit assistant for guidance. After the trial period, employees who switch from driving to riding receive a free Monthly Pass as a further incentive to continue riding. From start to finish, the Ready to Ride program takes four weeks. Two weeks are used in the beginning to promote the program internally to employees; while the following two weeks allow employees enrolled in the program a risk-free, public transit trial. The program's first year saw great success. 10 companies enrolled in the program, including Sherwin-Williams, Medical Mutual, Forest City, Calfee Halter & Griswold LLP, and Tucker Ellis & West LLP. RTA experienced a 30% conversion rate of drivers to riders, out of employees enrolled. 2012 promises to be an exciting year for the Ready to Ride program. The growth of Cleveland comes with parking premiums, traffic congestion, and more employees. Expanding companies, such as University Hospitals, see RTA's Ready to Ride program as a solution to their growing pains -- by offering their employees a sustainable and economical way to commute to work. RTA will be partnering with University Hospitals, The Cleveland Clinic, and Key Bank in 2012. Employers interested in learning more about this program are encouraged to contact Jim Frick, RTA's Sales Director, at 216.781.4764. "2011 was quite possibly the best year we have had in many years," said Joe Calabrese, CEO and General Manager of RTA. Revenue was above budget, expenses were below budget, and ridership grew at a healthy rate. As a result, 2012 will be a year marked with increased service, new service options, new hirings, and NO fare increases. The transit system will see a 4.3% increase in services, including increased frequency on 21 bus routes, beginning in January, and increased rail service starting later in the year. In terms of new service, RTA will add two Trolley lines, the C-Line and the L-Line, to the existing B-Line and E-Line. The C-Line will extend service hours until 11 p.m., 7 days a week. While the L-Line will give riders a free option on weekends and will extend the Trolley service reach to Lakefront attractions. North Coast attractions, including the Rock and Roll Hall of Fame & Museum, have long awaited the addition of a Trolley line that will drop would-be customers at their front doors. The L-Line will make this a reality on weekends, when RTA begins the new service in spring 2012. And the service cannot come soon enough, as Cleveland anticipates a huge year for tourism. The Rock and Roll Hall of Fame & Museum induction week kicks-off on April 5th and the Horseshoe Casino Cleveland opens in May. With an increase in tourists visiting the city, RTA encourages all travelers to utilize their Rapid service from Cleveland Hopkins International Airport into Downtown. From the plane to Downtown in 20-minutes without breaking the wallet, it is the easy, reliable, and economical way to visit the city. As attractions open around Cleveland, demand for service will continue to increase, and RTA is well-prepared with a healthy infrastructure and robust service options. RTA is more than a transit authority -- RTA is the critical link to exploring all Cleveland has to offer. And RTA has found a winning combination to stay connected with the community -- by partnering with local organizations and using Facebook for consistent interaction. The Cleveland Indians and RTA joined teams again in the 2011 season. During the baseball season, RTA gave Facebook friends a chance to win tickets, autographed memorabilia, and a suite experience, while Snow Days gave RTA riders a special any-day discount and ticket giveaways. RTA changed teams for the football season and partnered with the Cleveland Browns, bringing the community bus to the Municipal Parking Lot for a huge tailgate party. Riders received free food, played games, and won prizes. In response to the emerging culinary scene, RTA also partnered with E. 4th Street to promote the Lunch Pass -- allowing HealthLine riders to take a lunch trip Downtown and back at the price of a one-way fare, plus, they received a discount off their meal at participating restaurants. The Cleveland Auto Show showed RTA?s creativity to participate in special events. RTA put its luxurious Park-N-Ride coach on display and allowed attendees to sit in a "bus simulator" to experience how fun and relaxing riding the bus can be. Online, RTA is also making the connection. By using their partnerships to drive Facebook growth, friends have surged to over 12,000, making RTA the second most "liked" transit authority in the country, trailing only San Francisco. RTA will continue to be active in the community through events such as their annual 4th of July Fest for families and National Dump the Pump Day which encourages commuters to travel in a sustainable way. RTA's goal is to be an integral part of community life, rather than just another business in the area, proving their involvement reaches beyond transit. After managing through one of the worst recessions in history, RTA was able to achieve a strong financial comeback in 2011. Revenue improved, while expenses were reduced, allowing the transit authority to finish the year with a positive year-end balance, that will in part be used to restore service. Total Resources increased to $284 million in 2011. This gain was led by Sales Tax revenue. Sales Tax receipts represent RTA's primary funding source, covering between 60-70 percent of the operating budget. Revenue from Cuyahoga County Sales & Use Tax collections finished the year above budget estimates, as signs of the economic recovery were realized with more purchases made. The Sales Tax revenue in 2011 was $173.2 million, up by 6.1 percent from 2010. Passenger Fare collections, the second largest source of operating revenue, increased more than expected. The local economy improved with the comeback of the manufacturing sector. As a result, unemployment dropped slightly. In addition, gas prices rose significantly. The combination caused ridership to jump and fare revenue to reach $49.5 million, an increase of $2.4 million or over 5 percent. Operating expenses were $15.5 million below budget, ending the year at $210.4 million. Personnel costs were $13.3 million under budget and $2.0 million less than in 2010. Other expenses were under budget as well, coming in $2.2 million below forecasts. This included diesel fuel costs, which were kept under control through fuel hedge contracts and conservation efforts that reduced diesel fuel consumption levels by 308,000 gallons below the 2011 budget. Capital Expenditures were below budgeted levels, primarily due to delays in several expected grant awards that pushed budgeted project activities into FY 2012. In addition, there was a decrease in the use of capital grant funds to reimburse preventive maintenance activities within the Operating Budget. RTA continued to make progress on currently funded projects included within its Capital Improvement Plan, with 2011 activities laying the groundwork for a busy construction season in 2012. Financial Indicators also reflected RTA's improving financial position. Two of the six financial indicators met the Board Policy goal. One other was close to the goal. Operating Ratio for 2011 was 24.5 percent of total operating expenses, slightly higher than budgeted, but below the 25 percent established as a policy. The improvement was due to the lower-than-forecasted operating expenses, especially in personnel costs, and an increase in ridership. Operating Reserve not only met the board policy target of one month, it exceeded the target by an entire month. In 2011, a one-month reserve was $18.2 million. The ending balance, before reserved funds, was $38.4 million. Cost per Hour of Service is to be maintained at or below the level of inflation. At year-end, the cost per hour of service was $133.60. Since total service hours decreased at a greater degree than the operating expenses, total cost per hour of service increased. The Federal Reserve Bank of Cleveland calculates the inflation rate to remain at about 1.39 percent over the next ten years. With a cost rate of 9.8 percent, RTA was not able to meet this indicator. RTA's aggressive action to reduce expenditures also helped improve its Debt Service Coverage. The year-end ratio of 2.93 was well above the 1.5 minimum and much higher than the budgeted level of 1.49. This was a result of an increase in the General Fund Balance and a significant improvement in this indicator for the current year. The Sales Tax Contribution to Capital indicator has steadily grown since 2005, as the transit authority continues to invest more of its own funds to capital projects relative to its available resources. In 2011, this trend continued with the Sales Tax Contribution to Capital ending the year at 18.4 percent, well below the budgeted level of 19.1 percent, but also above the maximum policy goal of 15 percent. At 98.2 percent, the Capital Maintenance Outlay to Capital Expansion Outlay was also outside of the newly set 75-90 percent range outlined in the Board Policy goal. This continues to show that RTA's focus is first on the maintenance or state of good repair of its current assets rather than expanding service levels. Given the financial constraints of 2008-2010, this was the only course available.